Sometimes, you have an amazing idea for a project, but not the funds to make it come true. While there are plenty of ways to raise money, crowdfunding has become all the rage lately since it enables you to bypass traditional funding channels. The problem is, setting up a crowdfunding website can be complicated. However, if you’re using WordPress, there are plugins that can help you raise money for your project. In this article, we’re going to talk about when it makes sense to consider crowdfunding. We’ll then teach you how to launch a WordPress crowdfunding campaign in three steps, using Divi and the Give plugin. Crowdfunding enables you to raise money for your projects, bypassing traditional channels. Crowdfunding is a big word for a simple concept. You pitch an idea to the general public and if people like it, they pledge to give you money to help you make your idea a reality. For example, if you want to develop a video game but you can’t secure funding from a traditional investor, you can turn to your audience instead. If you get 10,000 users to give you $10 each for development costs, that’s $100,000 in the bank right there. Of course, the actual process is slightly more complicated. People won’t just throw money at you unless you can prove you have a project that’s worth it. Most times, you’ll even need to promise rewards in exchange for contributions. To build on our earlier example, you could promise contributors a copy of the game when it’s released, or exclusive backer-specific extras depending on how much they pledge. A proof of concept to demonstrate the final product. Interesting rewards offered to backers. Good marketing to generate buzz. While some are successes, many crowdfunding campaigns fizzle out without reaching their goals. Assuming the idea is good, that might give you a shot at success. If you have a project you’re considering using crowdfunding to complete, there are a few things you need to consider before you launch your campaign. First off, you need to consider whether your idea is a good fit for crowdfunding in the first place. For example, if you want to buy yourself a fancy bike, chances are people will laugh in your face if you ask them to give you the money needed. However, if you have an idea for a local bike-sharing service and you need a little capital to get started, that’s something people are more likely to get on board with. Secondly, you’ll need to do some work on your idea before you can present it to people and ask for money. For example, if you want to move forward with the bike-sharing idea, you’ll want to be able to show how the service would work. That means knowing how many bikes you need to purchase, how people would go about finding and returning them, how much a subscription would cost, and more. You should also consider what rewards to offer backers. For example, you could offer free subscriptions or physical rewards if they pledge to the project. Once you have a solid idea that’s a good fit for crowdfunding, it’s time to think about which platform to use to launch it. Some of the most popular options include Kickstarter and Indiegogo. The former is a great option for all types of projects, whereas the latter is focused on tech and design. There’s also another option, which is to launch your own crowdfunding site. That way, you can bypass traditional platforms and don’t need to pay a fee for hosting it on an external site, meaning you pocket more of the money yourself. If you feel up to the task, WordPress is the perfect platform to help you get everything set up. For this tutorial, we’re going to assume you already have an idea ready to go and a clean installation of WordPress. Let’s start at the beginning and talk about how to set up a landing page for your WordPress crowdfunding experiment. For a crowdfunding website, you’ll need to create a landing page that includes all the information people need to know about your project. It should also feature pictures, videos, and information about rewards, as well as how much money you’ve raised so far. That’s a lot to tackle in a single step and the process of creating a landing page could take several articles to cover. Fortunately, if you’re a Divi user, you’re in luck, because you have a lot of tools to help you set one up faster. Including over 70 layout packs that are free, right inside the Divi Builder, each containing a landing page layout you can use to get the design process started. If you want more inspiration, you can also check out this roundup of some of the most effective landing pages available online that use Divi. When you’re ready, move on to the next step, where we’ll cover crowdfunding plugin options. To power your crowdfunding efforts, you’re going to need a plugin that enables users to send you money. To do this, you can use one of several WordPress donation plugins that can integrate with a payment processor and provide visitors with multiple donation options. This also enables you to suggest specific donation sums, potentially to match different reward tiers. Give: We’ve used this slick donation plugin in the past for some other Divi projects. It’s easy to set up, free, and it supports PayPal out of the box. Plus, it makes donating money easy with short checkouts. 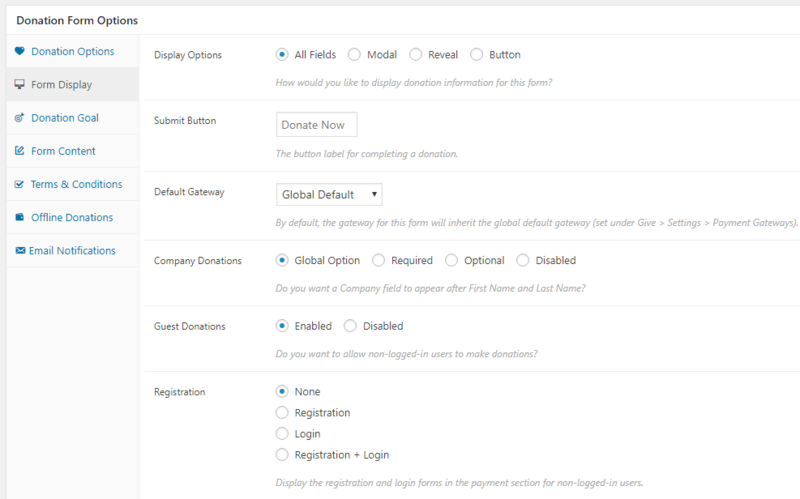 PayPal Donation: If you want to use a traditional PayPal donation button, this plugin can help you add one to WordPress in minutes. Charitable: This plugin is very similar to Give when it comes to functionality and it can help you set up limited-time campaigns if you want to use urgency as part of your marketing efforts. Multi-level donations are the most common when it comes to crowdfunding and they enable you to give rewards for different levels. 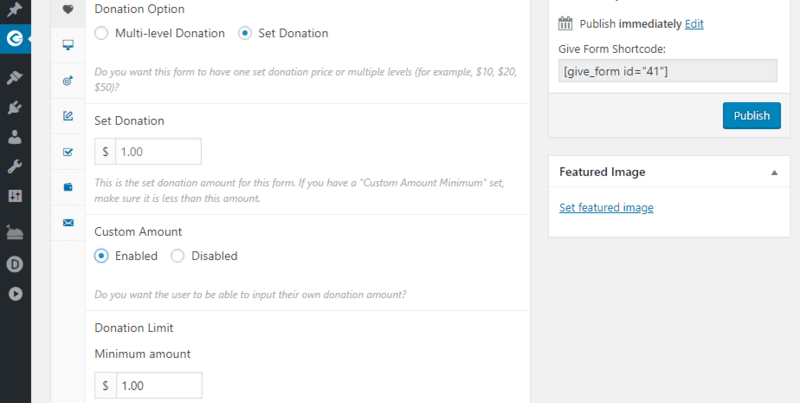 Set donations, on the other hand, offer a single option, although you can also enable users to donate custom amounts. Finally, you can also opt to use a drop-down menu for your donation form. Once you have specified these basic settings, save your form. We’ll come back to customize it later, but let’s first talk about how to add it to your Divi landing page. Once you have WordPress crowdfunding form ready to go, there are two ways you can add it to your website. Open your landing page using the WordPress editor now, which should have the Divi Builder turned on. Here, you can configure the text on your Submit Button and which payment gateway to use with your form. You can also choose whether non-logged-in users can donate money. In some cases, you may want to ask users to register before they make a donation. In which case, you can also set that up from this tab. Once you’re done, remember to save the changes to your tab. With that, you’ve successfully created a crowdfunding campaign on your WordPress site! Crowdfunding campaigns are an excellent way to raise money for almost any type of project you can imagine. If you have a dedicated base of followers and you offer some good rewards, raising the money should be relatively simple. Create a landing page using Divi. 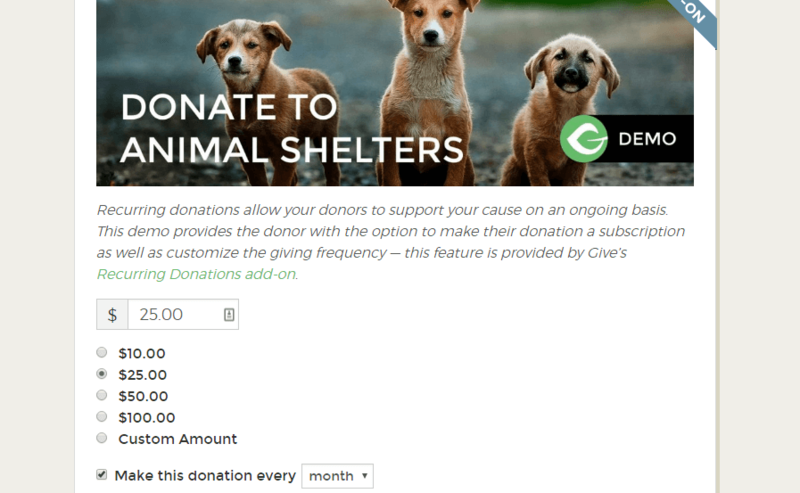 Install a WordPress crowdfunding plugin and create a donation form. Add your form to your website and customize it. Do you have any questions about setting up a WordPress crowdfunding website? Let’s talk about them in the comments section below! Hey John, help me a lot. Thanks for sharing! Can it be used not just for charities but financing products? If yes, then what is the difference between this and the two major crowdfunding sites? Also, I could not see what you would suggest for marketing this crowdfunding page. How people would know about this? I appreciate if you have or would suggest a method for marketing. Thank you. You’re very welcome, Dave. I’m really glad you found it helpful! Hi John, thanks for the helpful post. I am not yet monetizing my website, but had investigated using Patreon for crowdfunding. Any thoughts on this relative to Give?